Kenya's president and its main opposition leader met Thursday for the first time since the disputed Dec. 27 presidential vote sparked nationwide violence that left hundreds dead. President Mwai Kibaki and opposition leader Raila Odinga arrived at the president's office in downtown Nairobi for the meeting. They were accompanied by former U.N. Secretary-General Kofi Annan, who brokered their talks and is mediating. 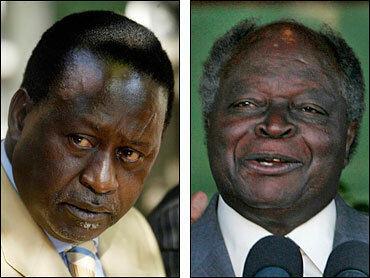 Kibaki had insisted on direct talks with Odinga, who refused to meet without a mediator. Annan is leading a mediation mission of the African Union that began work Wednesday. Some 700 people have been killed in violence that erupted after Kibaki was declared winner of the elections despite a deeply flawed vote tally. International allies have urged Kibaki and Odinga to negotiate a power-sharing agreement that might create a new position of prime minister for Odinga. Kibaki told Annan that he wants to resolve the political crisis, a government statement said. "President Kibaki also informed Mr. Annan ... on steps his government was taking to open political dialogue and ensure national reconciliation and healing," the statement said. In another encouraging sign, Uganda's President Yoweri Museveni won an agreement from both sides to set up a judicial commission to investigate vote rigging. Museveni met separately with Kibaki and Odinga on Wednesday. On Wednesday, Annan persuaded Odinga to call off protests that had been planned for Thursday in defiance of a government ban. Scores of Odinga's supporters have been gunned down by riot police in earlier demonstrations. New York-based Human Rights Watch, meanwhile, said Thursday it has evidence that opposition party leaders "actively fomented," organized and directed ethnic attacks in Kenya's western Rift Valley, where some of the worst violence has been perpetrated in the aftermath of the disputed election. Human Rights Watch said more attacks are being planned on members of Kibaki's Kikuyu tribe. An opposition legislator from the region denied the charges.